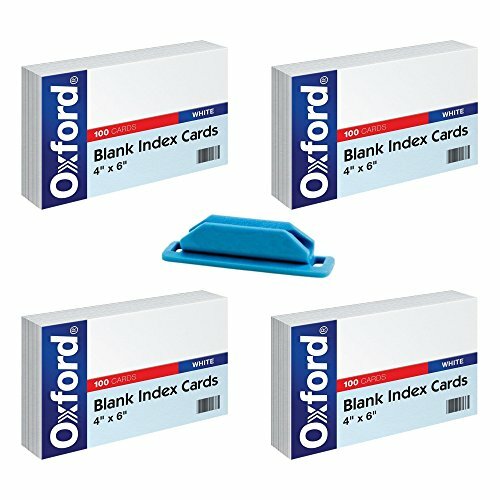 ➡️Oxford Blank Index Cards are blank on each side and rotary cut for uniform height. ➡️The design offers top-quality commercial stock for superior durability and performance. ➡️The 4" x 6" size is versatile enough for studying, presenting, and list-making. ➡️Paper made from 10% recycled fiber with 10% post-consumer fiber. ➡️There+W4 are 100 white cards per pack. From the Manufacturer Oxford Blank Index Cards are blank on each side and rotary cut for uniform height. The design offers top-quality commercial stock for superior durability and performance. ➡️The 4" x 6" size is versatile enough for studying, presenting, and list-making. Paper made from 10% recycled fiber with 10% post-consumer fiber. There are 100 white cards per pack. The ultimate study buddy, Oxford index cards can help you prep for tests, presentations and more. Whether you need blank, ruled or colorful options, we've got you covered. Organize your thoughts through a visual brainstorm, conduct a strategy planning session or plan a DIY home project-all with index cards.